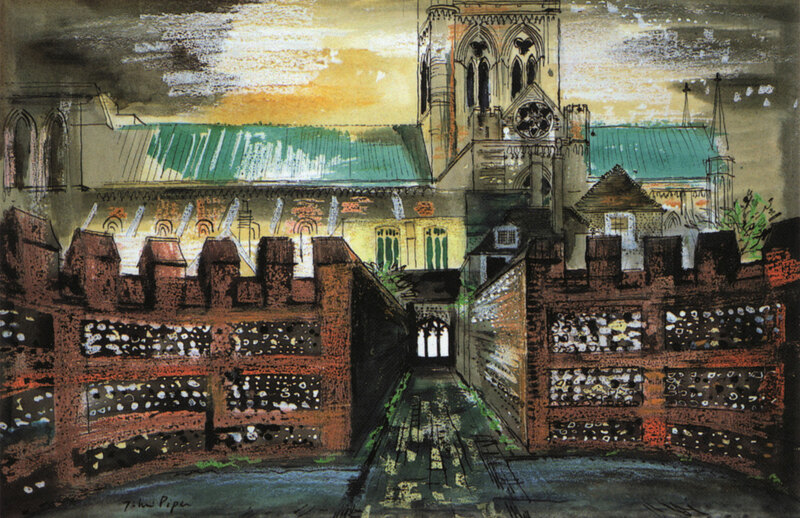 In the late 19th and 20th centuries many of Britain’s leading artists were inspired to leave London and our towns and cities, for the country. For some it was to escape the effects of the industrial revolution and for others the wars. There was a desire to articulate the ancient hope of the English expressed in and through their landscape. A hope bound up with a romanticized view of a rural idyll, lost or under threat. It was Virginia Woolf’s love for Duncan Grant and her sister, Vanessa Bell, which brought her to Sussex during the First World War. Vanessa was living with her lover, the artist Duncan Grant, and his friend David Garnett, at Wissett Lodge in Suffolk when her sister, the author, Virginia Woolf, wrote to her in the May of 1916. She extolled the virtues and potential of Charleston house near Firle in East Sussex. 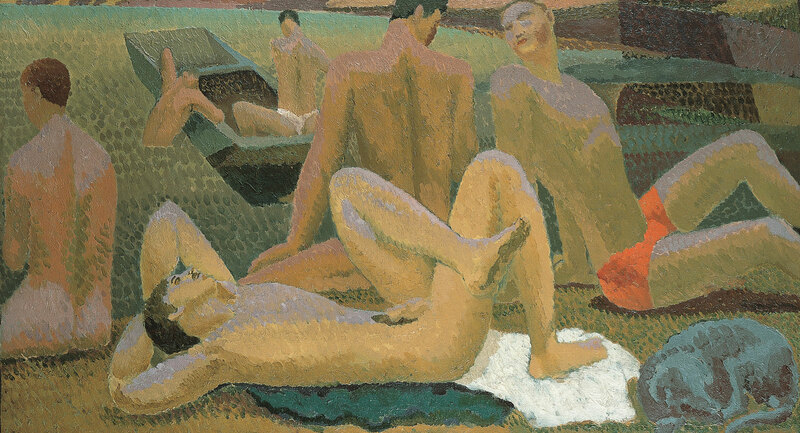 To avoid being called up to fight and the prospect of gaol as conscientious objectors, Duncan Grant and David Garnett needed to be essentially employed on the land. Virginia Woolf was by this time living at Asheham some four miles from Charleston and, having suffered a breakdown, sought Vanessa’s company. In her letters Virginia explained that not only did the house need a tenant but that the neighbouring farmer was short of ‘hands’ to work on the land. Vanessa Bell and Duncan Grant would gather an extraordinary array of artists, writers and intellectuals to Charleston. Amongst them was the great economist Maynard Keynes, the authors Lytton Strachey and T. S. Elliot, the artist and critic Roger Fry and, amongst many others, Vanessa’s husband Clive Bell. In London Vanessa Bell had married the art critic Clive Bell and was one of the leading members of what would become known as the Bloomsbury Group. She worked in the Omega Workshops with Roger Fry and collaborated with Duncan Grant in numerous decorative projects and artistic commissions. As well as covering the walls and furniture at Charleston with painted decoration they portrayed those who visited and the countryside around them. 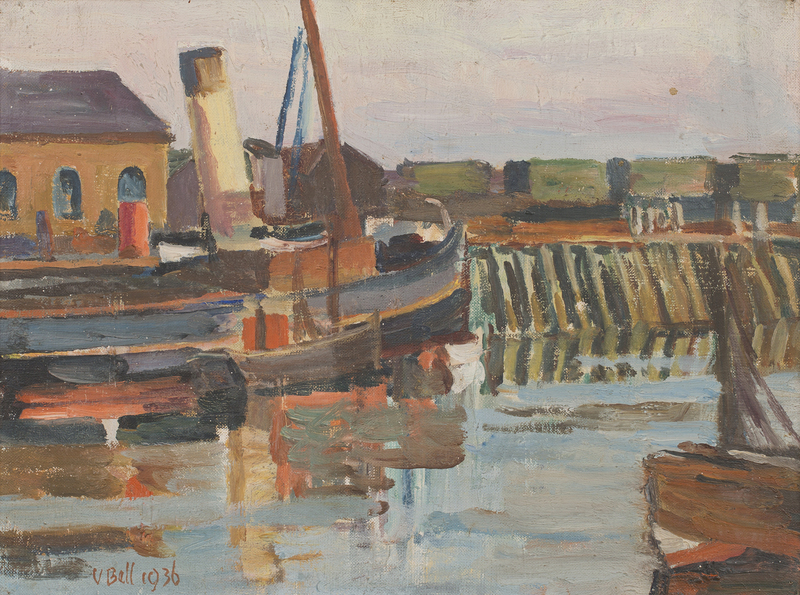 The delightful oil by Vanessa Bell titled ‘The Tug’ depicts a scene reminiscent of Newhaven harbour which is across the Sussex Downs from Charleston. The light is golden and luminous. 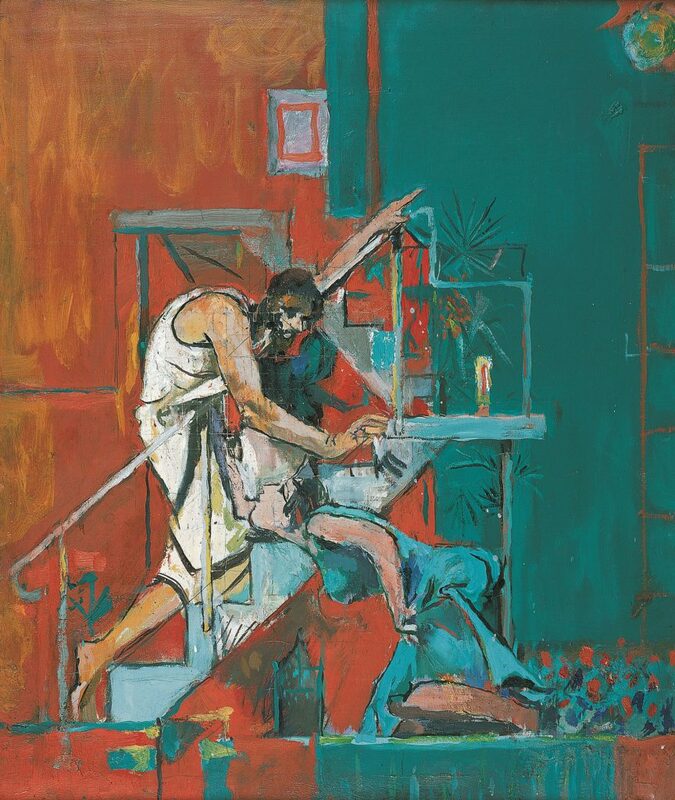 Her handling of paint is broad and filled with life and movement in the manner of the French Post-Impressionists. There is freedom and joy in the moored boat’s hopeful depiction. 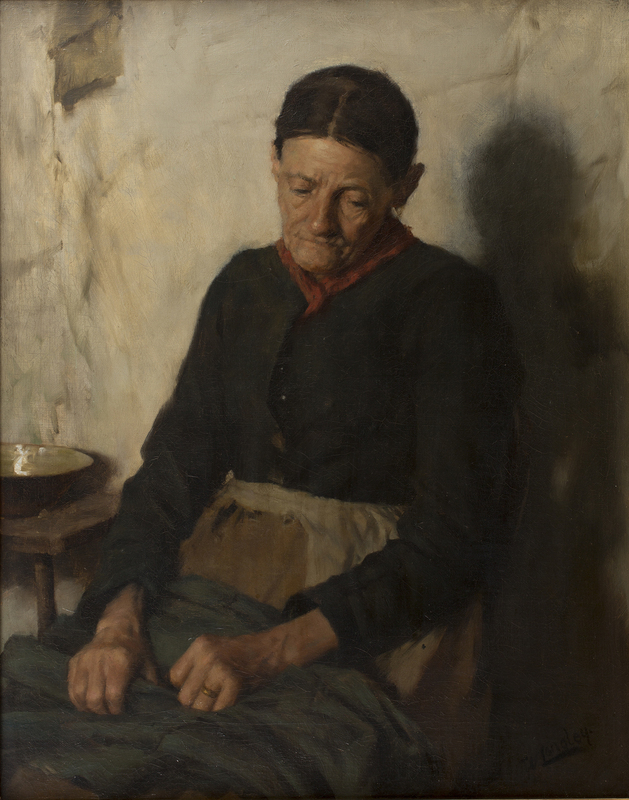 In contrast to Vanessa Bell’s bright palette is Walter Langley’s depiction of a working class woman at rest. Titled ‘A Quiet Time’ it reflects Langley’s empathy with the persistent hardship faced by the poor in 19th century Britain. Muted earth hues are employed in the stillness of this sensitive, delicate portrait. The economy of detail is typical of his portrayals of the working people of Newlyn in Cornwall. Walter Langley belonged to a group of artists from Birmingham who journeyed to Newlyn in Cornwall to escape the hardships caused by the Industrial Revolution in our cities. Their pursuit of realism was influenced by the French Barbizon painters. There is a romantic articulation of the nobility in working people. If Sussex and her Downs touch your heart the need to live in their folds never leaves you. Vanessa Bell and Duncan Grant would continue to live at Charleston throughout their lives. 2016 marks a century since the Bloomsbury Group artists, Vanessa Bell and Duncan Grant, arrived in Sussex to make their home at Charleston. I look forward to returning to Charleston and their array of events to celebrate this important anniversary. For more information go to www.charleston.org.uk/whats-on. Vanessa Bell’s and Walter Langley’s paintings are already consigned for sale in Toovey’s select Fine Art Sale on Wednesday 23rd March 2016, each with an estimate of £8,000-12,000.